Lily Mithen in the three quarter-time huddle last Saturday (photo by Darcy O'Loghlen). MELBOURNE’S AFL Women’s side will play a practice match against the North Melbourne Tasmanian Kangaroos at Casey Fields on Saturday morning. The game will kick off at 10:00am as the newly formed Kangas outfit play their first official match as a club. The practice match will be Melbourne’s second hit-out of 2019 after playing an intra-club match against the Casey Demons VFLW side last Saturday morning. 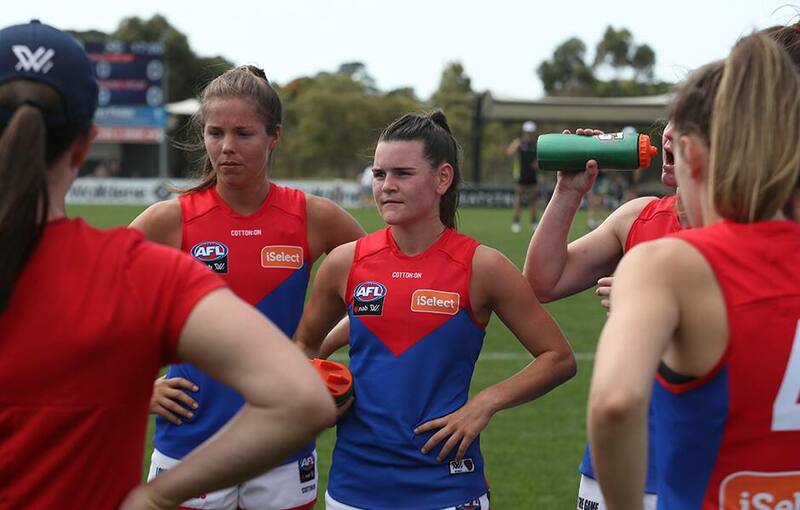 There will be some fresh faces on display for the red and blue this weekend, with the Demons unveiling recruits Maddie Gay and Talia Radan, as well as some young talent secured at the draft. Saturday’s clash is a great opportunity for the side to play on Casey Fields – a venue it finds itself at for three of its seven matches throughout the regular season. Melbourne will kick off its 2019 campaign at Casey Fields in a Round 1 clash with Fremantle on Sunday, February 3.